January 12, 2019 marked nine years since the disastrous 7.0 magnitude earthquakethat struck Haiti, levelling much of its infrastructure, crippling its already limping economy, and causing hundreds of thousandsof deaths. People in Haiti lost loved ones, homes, livelihoods, prospects. 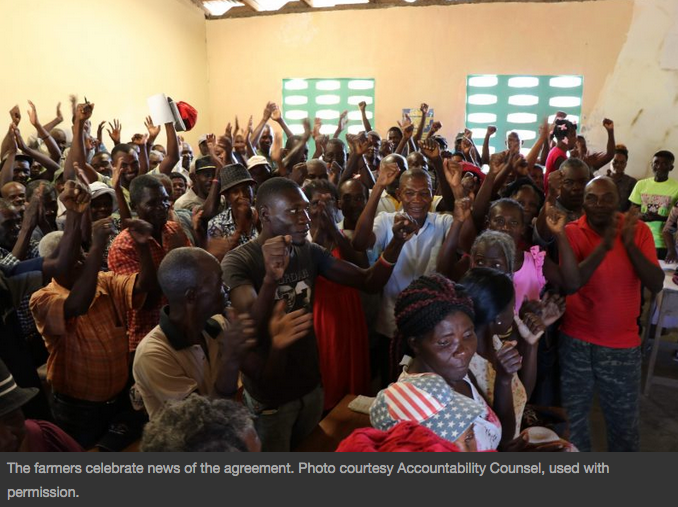 This year, instead of solely remembering the devastation, one group of Haitian farmers redefined what the anniversary of the earthquake means to them by signing a historic agreementthat will provide redress to the nearly 4,000 people in the northeast of the island who were displaced to accommodate the construction of the Inter-American Development Bank (IDB) and USAID-financed Caracol Industrial Park. Touted by the Haitian government as part of the earthquake reconstruction effort, the park was intended to jump-start the island’s economy and generate revenue“more than 150 times the estimated value of the crops grown on the 240-hectare plot” where the industrial park was being developed. The IDB offers a different versionof events. While both parties concede that in January 2011, a fence went up along the boundary of the project site, the farmers say that once it was constructed, they no longer had access to the land, and their crops were destroyed. 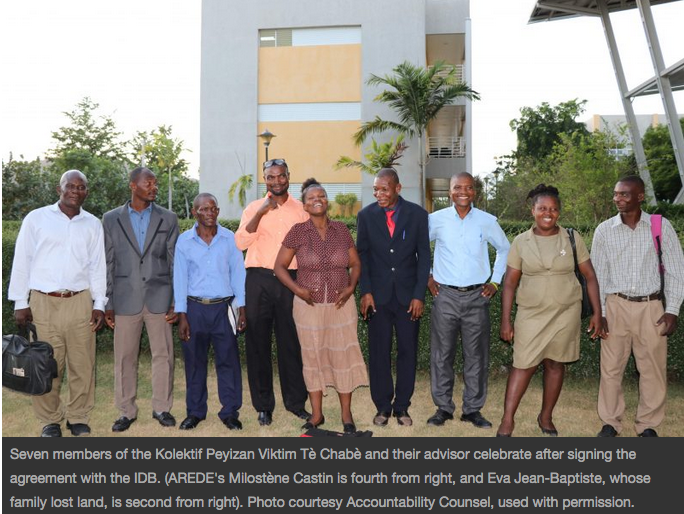 The IDB maintainsthat had access to the land until later that year. 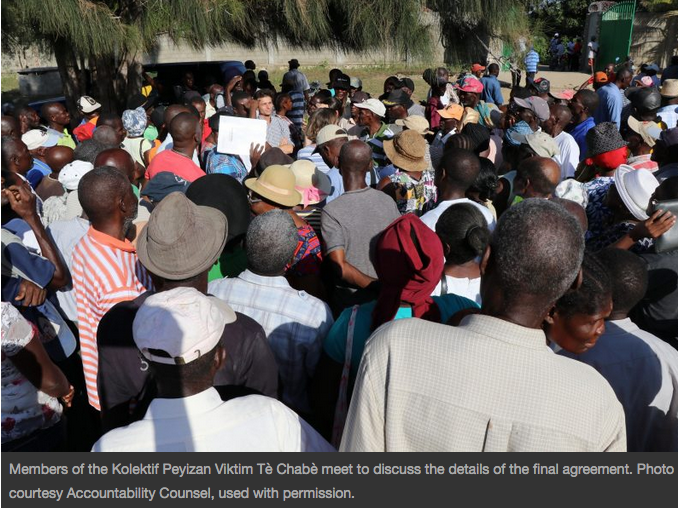 The little compensation the farmers eventually received began trickling in only in September 2011. The replacement land they were promised never materialised. The story could have ended there. 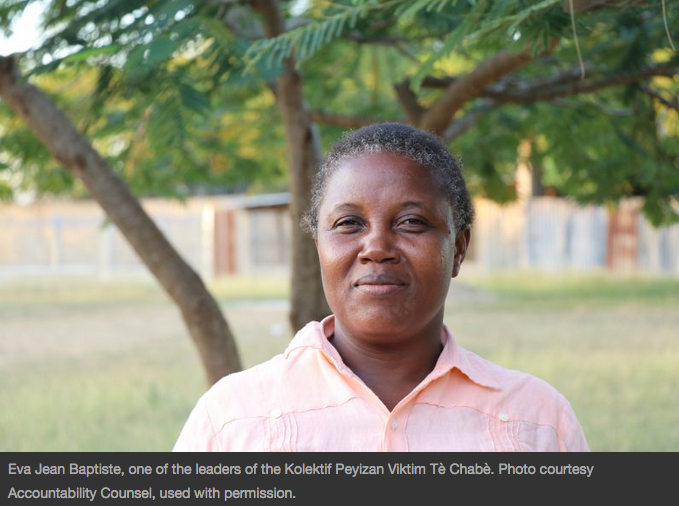 But after receiving the final cash payout in late 2013, and realising it wasn’t enough to help them rebuild sustainable livelihoods, the farmers formed a collective — the Kolektif Peyizan Viktim Tè Chabè — to defend their rights. While the Kolektif represents the interests of all the displaced farmers, 415 signed on formally to the group. 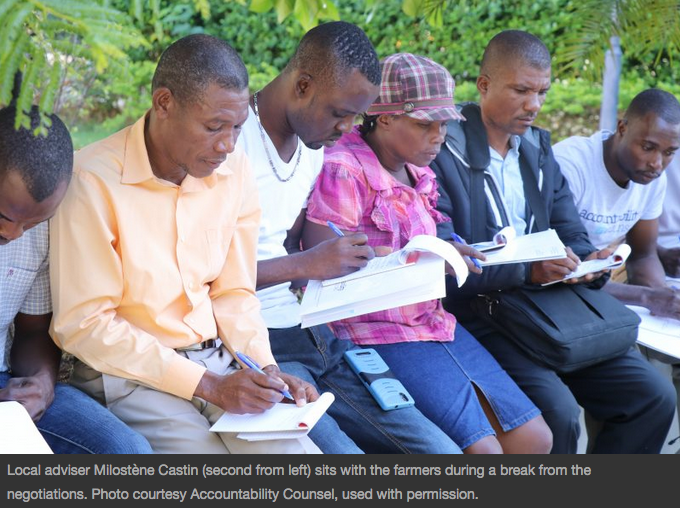 On January 12, 2017, with assistance from local and international civil society organisations, the farmers filed a detailed complaintto the IDB’s accountability office. They asked, among other things, for fair financial and non-financial compensation and educational support for the victims’ families. With Castin’s help, the farmers formed the Kolektif and began organising themselves into committees. 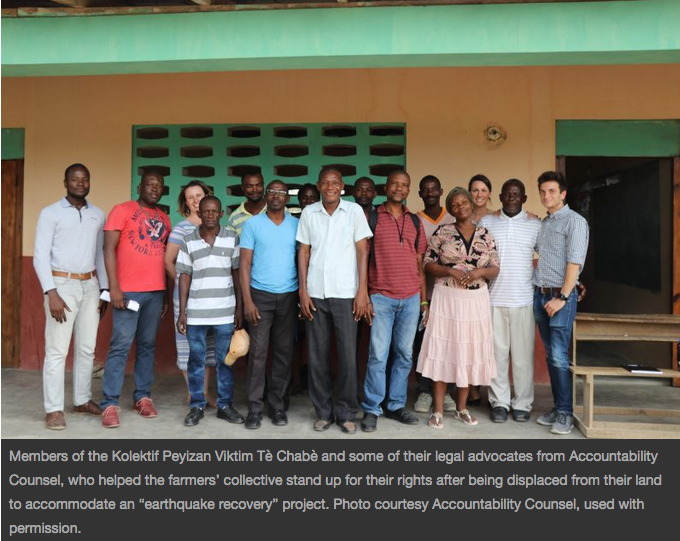 They had a clear strategy for reclaiming their livelihoods: make all affected families aware of what was at stake, and seek support where they needed it. Action Aidcame on board to help compile and analyse information, and Accountability Counselhandled the legal aspects of lodging the complaint. Even today the everyday reality is tough, but Eva is proud that the Kolektif defied the odds. She calls the case “seminal”. “We knew we were telling the truth,” Eva explains. The “coalition strategy” gave them the strength to put pressure on both the government and the IDB. The farmers knew that all the bank’s operational protocols with regard to the industrial park had not been followed, including environmental safeguardsand policies on involuntary resettlementand gender equality in development, and felt that they could effect change. In Haiti, women spend more time at home with the children. We had nothing to fall back on, nothing to sell at the market. Some people even tried to take loans to feed their families or send their kids to school. What we suffered through the most was the loss of our dignity. We had nothing, and the women saw it all first. We were looking directly at the misery, day after day, when we couldn’t feed our children or send them to school. At least the men could leave home and try to do something, even if they came back with nothing. Now that the agreement has been signed, Eva is satisfied, even though the collective didn’t get everything it wanted. 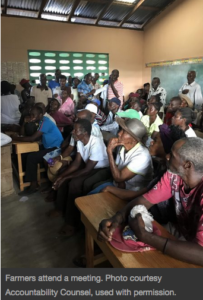 They had hoped, for instance, that the IDB would bear the full cost of their children’s schooling, but the IDB agreed instead to provide two packages of school supplies and support materials for each family.